Genre: High school girls comedy. Notes: Based on a 4koma by Komata Mikami, serialized in Manga Time Kirara. Three members of the Data Processing Club; Yuzuko Nonohara, Yui Ichii and Yukari Hinata, fill their days with jokes and goofy antics. I stated in my review for Aiura that the show could've done with a longer episode runtime, and in many ways, Yuyushiki addresses this issue quite admirably. A full TV series filled with absolutely nothing but gags by the main cast and the few people they interact with on a somewhat regular basis, the show is somewhat of a safe haven if you're into the kind of comedy this show represents. But this immediately puts me in a bind. How do I present this show? It doesn't really do anything in particular, and one has to wonder what one was supposed to have learned by the end of it all. Now, Yuyushiki is hardly the first show to spend all of its runtime goofing off, but it's certainly one of the strongest contenders in that area. Yui Ichii is this show's straight man in high school girl form. Her job is basically to endure the antics of Yuzuko and Yukari, to which there are many. The two of them seems to have set out on a mission to drive her crazy, and most of the time, they do at least drive her to the point of applied violence. Yuzuko's favorite method seems to be random applications of sword jabs or just dumb gags or jokes in general, and she's the kind whose mannerisms hides well the sharp intelligence hidden underneath. In a way, she feels like a homage to a friend of mine that passed away many years ago. He could make anyone angry at him on a moments notice with his antics -- or, as the Norwegian saying goes (awkwardly translated); "he could tease a grey rock on himself" -- but now that he's gone, I kind of miss him and all the stupid things he did. Yukari, on the other hand, seems like kind of a dumbass. She tends to go with the flow more often than not, and mostly Yuzuko's flow at that. (Much to Yui's chagrin.) She's a part of a rich family, which the show points out, but doesn't really embellish on. Those of you who expect her to act out a "hime-personality" based on this little tidbit of information are only setting yourselves up for disappointment. Despite her apparent dimness, she's got a talent for picking and following up on the random gags Yuzuko unleashes, and she's almost as good as Yuzuko at coming up with her own. It's hard not to get caught up in the sheer insanity of it all. The nice thing about this show about nothing but the jokes is that you never really know what to expect. It's not a high-octane show either. Instead, Yuyushiki seems to have found that magical middle ground where it takes something mundane and turns it into a fun conversation; kind of like those moods you sometimes get into, mostly late at night, where everything suddenly and magically turns hilarious. Part of it is because of the familiarity; if you've hung out with friends, you have had these kinds of conversations. It adds a warm feeling over the whole thing, and marks it heads and shoulders above shows that simply try too hard to be funny. 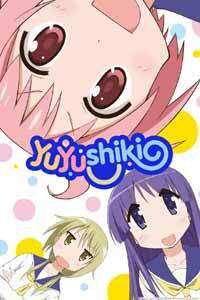 Yuyushiki's art is relatively simple; character designs are fairly cartoonish and elementary, and the backgrounds are your typical city/school/apartment backgrounds, drawn with relatively simple detail. To make up for that, the animation is usually very smooth, giving the show the energy it needs. Comedies in general has been a bit of a variety bag as of late. I've never really taken to the high-octane ones that's all about being as loud and hyper as possible, so it's been a real treat to find one that's energetic, but in a more laidback fashion, and who actually puts some thought behind its acts of seemingly random stupidity. Wanting to slap someone at the back of their stupid heads have never been so entertaining. Recommended Audience: There is some light fanservice; the girls occasionally talk about breasts, and dreams of some light groping. Outside of that and two instances of swimsuits, the show is perfectly clean. ...well, aside from the slapstick... slaps.